Este bonito apartamento de 90m² esta decorado con colores vivos y amueblado con un estilo moderno. Se encuentra en la primera planta de un edificio con ascensor y cuenta con tres dormitorios, ideal para 2 parejas o una familia. El primero dispone de una cama de matrimonio (140x200) y de un televisor (sólo para reproductor de DVD) además de un baño propio, con bañera/ducha. La segunda también está equipada con una cama de matrimonio (140x200). Hay un tercer dormitorio con una cama individual. El segundo cuarto baño dispone de los mismos equipamientos. En el salón dispondréis de televisor por cable, reproductor de DVD y CD y conexión a Internet WiFi. Además tenéis a vuestra disposición un comedor con una mesa. La cocina está equipada y tiene una lavadora. Por último, podrás disfrutar de la esplendida terraza de 96m² con mesa y sillas. Se encuentra en el barrio del Eixample, en calle Arago con Padilla. En la zona encontrarás varios restaurantes, tiendas y cafés. Las estaciones de metro Monumental (L2) y Sagrada Familia (L2 y L5) están a 5 minutos del apartamento. Disfruta de un bonito paseo de camino al centro admirando la arquitectura y los monumentos de Barcelona. En caso de no haber abandonado el piso antes de las 11h, se le pedirá que abandone de forma inmediata el apartamento y se le cobrará un coste extra de 50. Se ofrece servicio de limpieza, cambio de sábanas y toallas extra durante la estancia. Precios y horarios a consultar con el propietario una vez efectuada la reserva. No está permitido realizar barbacoas. 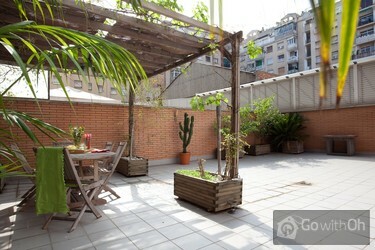 The apartment was lovely, well furnished, modern, beautiful private terrace with BBQ, chairs, patio. Very close to the Sagrada Familia - what a thrill to see it each time we took the subway morning and night. Grocery store close by (1 block away). 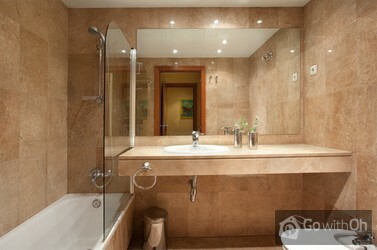 Apartment was perfect for two couples - each had a private bathroom. Would certainly rent this appt. again. Accommodation was very good, had everthing we needed. The surrounding area was not so good, but as it was only a few mins walk to transport,that was fine. More info on local amenities ie. supermarkets, cafes etc would have been useful. El apartamento con todas las comodidas que necesitas imaginas y deseas: TV con Imagenio y satelite, equipo de musica, aire acondicionado en todas las habitaciones, muy silencioso y una cocina completamente equipada. La persona de contacto muy agradable y eficiente. En fin, todo muy bien!!! Bon emplacement, appartement agréable, sevice et accueil un peu brusque. Well worth staying in. The garden terrace was perfect. 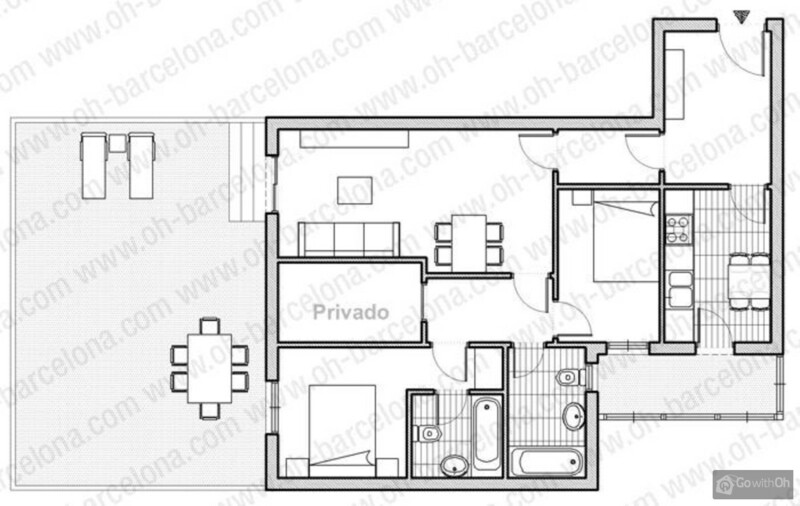 The location just two minutes from the metro and then easy access to anywhere in Barca. Next time we visit Barcelona we will be staying here again. 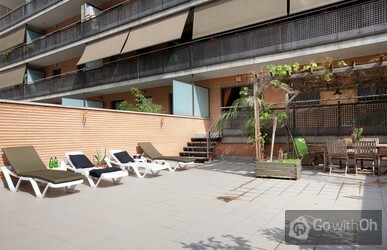 Very good location , near Sagrada Familia, nice , clear and great apartment with big outside terrace. It was only a basic room with sheets. We needed to buy even the toilet tissues. There was wifi, but was not able to connect. It was under restricted connection. At the time of check in, a palmlet with the code to access could have been given. excellent location and very quite. Very well equipped and spacious. Gorgeous terrace! Cleaning was not optimal: dust everywhere!! Contact person was not so polite. Departamento muy cómodo. Destaco la terraza que es muy agradable y el hecho de tener dos baños lo cual otorga independencia (éramos dos matrimonios). El 2º cuarto un poco pequeño, dificultoso para moverse. Hubiera sido muy conveniente tener teléfono para usarlo con tarjeta lo que no produce gasto alguno. La ubicación excelente. The accommodation was good. We stayed there for 10 days but if we halfway would have wanted clean sheets on the beds and clean towels we would have to pay more. That was a disappoitment for us because the appartment was not very cheap and we would have found that normal. In the kitchen was only one teacloth and no towel at all. First class apartment for family use - would stay in the same apartment again. appartement très confortable et très fonctionnel. Un point d'amélioration serait un peu plus d'infos à l'arrivée sur les déplacements dans la ville (métro...plage...) excellent séjour! NOTE DE OH (13 OCT): A partir du 15 Aout dans lappartement, sera à disposition des locataires, un guide touristique de la ville. Bei 10 Tagen Aufenthalt ist einmal Handtuchausstattung zu wenig. Reinigung könnte gründlicher sein. Kühlschrank bedarf häufiger einer Grundreinigung. The apartment is just like the description. Clean, spacious, warm, welcoming, very quiet. Super location! Sagrada (and metro station) just 2 blocks away. Grocery store just around the block. Superb terrace, too bad the weather was cold and rainy. Well equipped kitchen. Contact person was very polite... and willing to help. One day we had no cable TV and internet but after just one phone call everything was back online. We've met wonderful people! Thank you all (R., J., S....) for a very pleasant stay! Appartement superfonctionnel et quartier agréable, calme et bien desservi.Seul bémol, la vaste terrasse est vraiment sous le regard des immeubles voisins la construction de l'immeuble est sonore. Excellent apartment and great value for money. 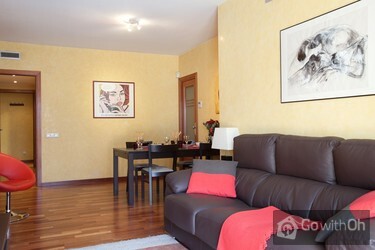 Beautiful, spacious apartment with great terrace. Located close to metro and grocery stores. Kitchen works well for simple meals. We appreciated the quiet atmosphere. Good wireless internet service. Schöne Wohnung, leider etwas verschnitten. Sehr schöne und große Terrasse. Leider gabe es in der Nachbarwohnung sehr laute Renovierungsarbeiten, die rund 3 Tage anhielten. Das Geschirr mussten wir vor dem ersten Benutzen komplett einmal abwaschen, da es doch sehr dreckig war. Fazit: Unterkunft ...ok, ich denke es gibt für das gleiche Geld bessere Unterkünfte. Die Wohnung ist genau so schoen, wie in der Beschreibung aufgefuehrt. Leider war sie total verstaubt. Man sah, dass sie seit laengerem nicht benutzt und vor unserem Eintreffen nicht mehr gereinigt wurde. Leider ist unsere Kontaktperson nicht auf den Hinweis eingegangen. Schade, denn ansonsten ist ...die Wohnung perfekt! Es hat alles super geklappt! Auch unsere spaete Anreise (23.00 Uhr) war kein Problem - vielen Dank nochmal! Gerne wieder! I was amazed by the apartment. I loved it. Specially the terrace was great. The beds sleep good. Very silent at night (the street is on the other side of the building). Both bathrooms are very nice and clean (good powerful shower) Kitchen is very spanish (not very cosy white light) but functional. ...Tv is a little outdated (colors vary throughout the screen). Our kids (2 and 6 of age) did not bother and watched some dvd's. 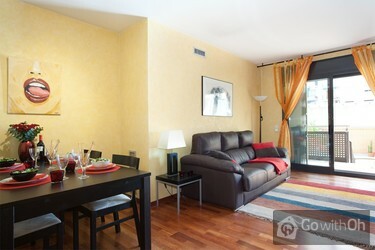 Barcelona itself is great and very reachable from this apartment. Sagrada is 2 blocks away (five minute walk, even with two kids ;-) ) Metro the same. The neighborhood feels safe. Watch your stuff everywhere off course, but I felt more alert at the ramblas. In other words, nice street even at night. Writing this, want to go back soon! Good organized. Nice lady showed us around. Did not need them further. Die Wohnung liegt toll, citynah und trotzdem ruhig. Die Terasse ist großartig. Im Umfeld gibt es einen Markt und zahlreiche Cafes und Tapaskneipen, die auch von Anwohnern besucht werden. All excellent except the floors were a little dirty. Excellent all round and thanks for keeping the accommodation open for us a year after the volcano had made it impossible to fly to Barcelona last year. 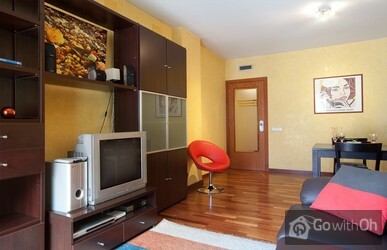 A great modern apartment in a convenient location. We had a fantastic time exploring Barcelona from here. Apartment as expected from the pictures. The water of the kitchen sink needs fixing though. Only steaming hot water is running. Also, basic supply of cleaning products would have been appreciated. The dishes were not washed properly (lipstick on glasses ect.). A little bit dusty, as well. Vom Zuschnitt her war die Wohnung hervorragend. Die Sauberkeit war zu bemängeln. Das Küchengeschirr war teilweise verschmutzt (Tassen, Besteck). In einer Kanne war noch Mehl, welches bereits am Boden angeklebt war. Der Toaster war defekt. Er wurde nach Anzeigen des Mangels am 2. Tag auch ...nicht ausgetauscht. Im Wohnzimmer war auf dem Mobilar eine Staubschicht. Die Stühle wiesen zahlreiche Flecke auf. Einige Glühbirnen waren defekt, die dann jedoch ausgewechselt wurden. Die Pflanzen auf der Terrasse hätten auch eine bessere Pflege verdient. Toilet water flash need repaires, terasa very good , but plants terible. Die Wohnung ist wunderbar, tolle Terasse, alles genau so, wie wir aufgrund der Beschreibung und Fotos erwartet hatten. Nachts war es sehr ruhig, am Tag Werkstattlärm auf dem Hof, aber da waren wir ja auch unterwegs. Mehrere Metrostationen sind schnell erreichbar, sicheres Viertel mit vielen kleinen... Supermärkten, Gemüseläden, Bäckern, Bars, Restaurants. Die Küche gut ausgestattet, nur ein Küchenhandtuch mussten wir selbst mitbringen. Die Waschmaschine befindet sich auf eigener kleiner Lichthofterasse mit Wäscheleinen. Helpful, informative and very knowledgeable about the area and made us aware they had a 24hr number available throughout our stay. The contact person was very friendly and gave us the many information. Very nice appartment, everything we needed was there. Very clean. Taxi fares are quite cheap (a taxi to Passeig de Gracia is 5 euros) and taxis very easy to find. Nous sommes très satisfaits de notre séjour. L'accueil et les conseils sont de très bonne qualité. The owner confirms that he has fixed the problem with the light bulbs and put a new toaster. Waren begeistert von der Wohnung. Es wurde nicht zu viel versprochen. Accueil très sympathique et très serviable ! appartement très propre et très beau !!! Grand merci O.! L'alloggio è spazioso e arredato con cura; c'è davvero tutto: dalla lavatrice al tostapane, dalle pinze da bucato alla connessione Wireless gratuita per Internet. Tuttavia la ricercatezza nei materiali d'arredo ne ha penalizzato la praticità di pulizia per cui su tutto sono molto evidenti i ...segni del "tempo". I due bagni sono bellissimi. Il terrazzo è enorme ed è sicuramente il punto forte dell'appartamento, ma anche la presenza del condizionatore all'interno è una vera benedizione. La pulizia della cucina e delle stoviglie in dotazione si è rivelata un pò troppo approssimativa. Un consiglio: portatevi da casa qualche asciugamano di ricambio. Die Wohnung war in Ordnung, nur war in einem Zimmer das Bett (der Lattenrost) kaputt, die Kontaktperson hat sich aber dann darum gekümmert. Innen war es sehr sauber, aber die Terrasse war eher provisorisch gesäubert worden. Das Fenster von einem der Schlafzimmer geht in einen Lichtschacht. Der ...Fernseher war zu unserem Aufenthalt leider ohne Sat-Anschluss, es gab nur spanische Sender. Sehr nette Kontaktperson und pünktliche Schlüsselübergabe. El apartamento esta muy bien ubicado, es comodo, la terraza es muy agradable. Con niños la terraza fue una ventaja ya que tienen muy buen espacio. A mejorar: la limpieza, el apartamento estaba mal limpiado, la terraza bastante sucia. Pasar el aspirador produndamente por todo el apartamento haria la... llegada y la estancia perfecta. No caeria mal renovar el material en la cocina, una vajilla nueva y una buena sarten serian de gran utilidad. Estabamos en familia por lo tanto usamos mucho el apartamento, volveria a quedarme aqui, solo pediria que lo limpiaran mejor. The apartment is not very central but it is in a pleasant area. It was not very clean, the WC and the floors were dirty. The wardrobes were full of bedding so there was nowhere to hang clothes! There was only one sofa! Unfortunately the balcony had bags of old leaves and rubbish stored on it, and ...it was an eyesore to look at when it could have been so nice. It was rather uncared for. However the beds were very comfy which is very important! Dear clients, Oh thanks you for and values your comments. We can confirm that the bags of old leaves and rubbish have been removed from the terrace so that clients can go out and enjoy the pleasant environment. The apartment was well appointed and met all our requirements. Good security, good appliances including washing machine. 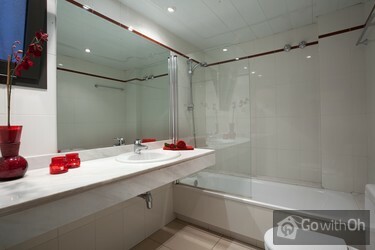 Having two excellent bathrooms and showers was particularly handy for two couples. Small criticism - the second double bedroom is small but adequate - we stored our bags in ...another room. The large outdoor deck is a bonus and having an outdoor table and chairs is great in Barcelona. The location is very handy to the Sagrada Familia with lots of cafe's, tapas bars and food shops including superettes within a block's walk. Metro station (Sagrada) is only 2 blocks away and the Metro is fantastic (and cheap) to get around central Barcelona (La Rambla etc)which is a bit far to walk to from here. Uno de los dos cuartos es demasiado angosto: muy dificil meterse en (y salir de) la cama. La ubicación y el barrio nos pareció excelente por la tranquilidad y la cercanía a la Sagrada Familia. Siempre tuvimos una persona de contacto a nuestra disposición, lo que da muchísima seguridad. La única pega es que nos dieron información errónea sobre las posibilidades de aparcamiento,... pues durante el fin de semana es gratuito en la misma calle del apartamento. El apartamento, a pesar de ser muy amplio y estar muy bien equipado, nos decepcionó la limpieza, deterioro de las paredes y que la cisterna del baño de la suite no funcionaba correctamente. Nous avons été confortablement installé dans cet appartement. J'ai quelques remarques négatives a faire cependant. La cuisinière a un four qui ne fonctionne pas Il manque des couverts aux marmites. Je ne recommanderais pas à quelqu'un d'arriver le soir car nous avons été inquiet de ne ...trouver la personne qui devait nous attendre. Il n'y avait personne dehors et aucune indication qui identifiait l'endroit.Heureusement, le jeune homme est arrivée après QQ minutes . Le fait de ne pas avoir eu de téléphone portable nous a causé des soucis car nous n'avons pas eu accès facilement pour aviser de notre arrivée dans l'heure précédant. J'avais bien confirmé par courriel mais votre demande de ré confirmer juste avant notre arrivée nous a causé un stress inutile. Cher Client, Nous vous remercions pour vos commentaires. Nous regrettons que votre séjour nait pas été à la hauteur de vos espérances et nous vous confirmons que le four de la cuisine a été contrôlé et quil fonctionne correctement. De même nous vous rappelons notre entière disposition pour résoudre tout incidence qui pourrait surgir durant votre séjour. Acccomodatie prima, maar het prachtige terras en meubilair buiten waren dringend aan een schoonmaakbeurt toe, jammer want terras is geweldig! Dear Client, From Oh, we thank you for your comments. We can confirm to you that we have checked the state of the terrace and have taken the necessary measures to ensure an impeccable state, in order for all the customers to be able to enjoy it during the stay. Lovely apartment in a good location, we really enjoyed our stay and would definitely come back. Would definitely stay in this area again, much quieter than Las Ramblas etc yet still only a 7 taxi ride home. The terrace was great, comfy beds and everything sparkly clean, we were really happy, thank you. Lage zum Innenhof mit Terrasse ist sehr ruhig und angenehm. Die Wohnung war sehr sauber und schön. 2 sehr schöne Schlafzimmer mit jeweils eigenem Bad/Dusche/WC. Super! Die Kontaktperson hat schon auf uns gewartet und war sehr hilfreich. Die Küche sollte noch etwas besser mit Geschirr ausgestattet... sein (mehr Becher/Tassen, Schalen, Töpfe), aber ansonsten sehr schön. Die Fernseher/Heimkino-Anlage haben wir nicht zum Laufen gebracht, aber das lag wohl auch an uns. Supermarkt, Bäckereien, Obstgeschäfte alles in wenigen Minuten füßgängig erreichbar. U-Bahn Sagrada Familia ca. 400 m zu Fuß. Mit 1 x umsteigen kommt man eigentlich überall hin. Mit dem 10er Ticket (T-10) zu 9,80 kommt die Fahrt auf < 1  und ist somit wirklich zu empfehlen. Ich würde die Wohnung jederzeit wieder buchen. Difficulté à faire fonctionner le four en mode manuel, il reste en mode programmé. La porte de la salle de bain ne fonctionne pas normalement, elle se bloque en position verrouillée , risque d'y rester enfermé. La situation de l'appartement est idéale à proximité de la Sagrada Familia et ...du métro, beaucoup de supérettes dans le quartier pour faire les courses. Cher Client, nous vous remercions pour vos commentaires, nous les avons bien pris en compte. Le propriétaire confirme avoir contrôlé le fonctionnement du four et de la porte de la salle de bain. De même il réitère sa disponibilité pour nos clients durant leur séjour afin de résoudre les éventuels problèmes le plus rapidement possible. 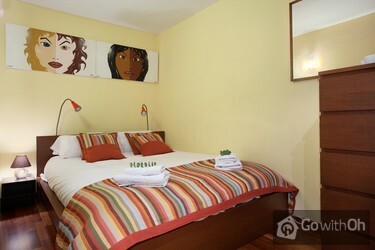 I strongly recommend our accommodation :); really enjoyed our stay in Barcelona. Fantastic town and experience ! Le professionalisme de l'équipe d'Oh et la gentilesse de G ont rattrapé le début chaotique de notre séjour : avion bloqué au départ, plus de 2H de retard mais pas de problèmes,aprés un petit coup de fil et 2/3 SMS tout était réglé ;-) Pas de mauvaises surprises par la suite, l'appart ...ressemble aux photos, la terrasse est immense, tout prés de la segrada familia, bref que du bonheur. Un ami avait pris sa voiture et on a pas eu de soucis pour trouver un parking (non payant uniquement le week-end/jours fériés) mais pour une visite en semaine je conseille fortement de louer le parking de l'immeuble. 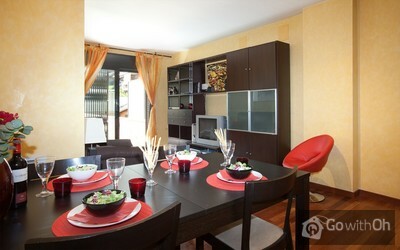 Je recommande cet appart chaleureusement ! La persona di contatto veramente squisita e disponibile, ci ha illustrato le varie parti della città e consigliato come muoverci. L'appartamento è in una zona molto centrale da cui è possibile raggiungere comodamente i mezzi di trasporto. L'alloggio era non troppo pulito, il pavimento della ...terrazza sporco, consigliamo di portare le lenzuola per il letto ( sulle nostre erano presenti capelli ). In una delle due camere il letto aveva le doghe rovinate, non si riusciva a dormire bene; l'altra camera troppo piccola ma comunque per dormire era abbastanza. Nell'insieme l'alloggio è comunque accogliente e funzionale. Sehr schön ausgestattetes ruhiges Appartement in guter Lage und guter Metro-Anbindung (ca.300m Sagrada). Leider kein deutschsprachiges TV, was sich aber bei einem Barcelona-Besuch erübrigt. ( W-Lan vorhanden ). Bei Bezug Steckdosen und Lampen auf Funktion überprüfen, Deckenverkleidung im Bad ...nicht komplett. Würden dieses Appartement aber jederzeit wieder buchen! 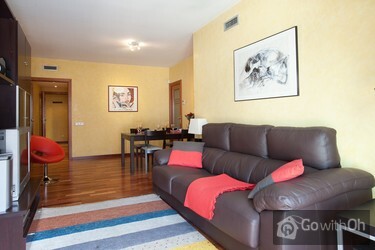 Fantastic apartment a few blocks from Sagrada Familia!! Nice patio. Clean kitchen and living space. Almost perfect! Could have used a bit more space with a dresser in the master bedroom, but otherwise I wouldn't change a thing. Not much in the way of good eating options nearby, but we were always ...going somewhere and found food there. The apartment contact was very informative before our trip and responsive during our stay, especially when we tripped a breaker and called him to get power back on. Die Ferienwohnung geräumig, sauber und zweckmäßig eingerichtet. Die Lage ist hervorragend. 3 Gehminuten bis zur Metrostation direkt an der Sagrada Familia. Einziger Wermutstropfen: das Apartment ist sehr hellhörig. particulièrement agréable, le fait qu'il y ai 2 salles de bain, surtout lorsqu'on vient a deux couples comme nous . Logement spacieux rien ne manque si ce n'est un peu plus d'ustensiles pour cuisiner. 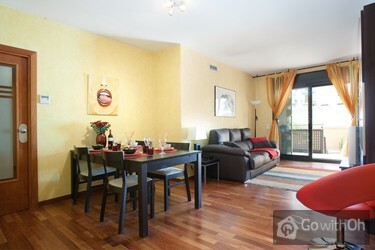 Beautiful clean apartment with fabulous roof terrace. The owners could not have been more helpful. Would definitely book again if returning to Barcelona. FALTA SERVICIO DE CAFE.LIMPIEZA DE LA TERRAZA.POR LO DEMAS TODO PERFECTO. The apartment was very central and conveniently located. It was rather dark and the patio could have been a bit cleaner Very good handover (though the person that met us was late) and everything worked as stated. Helpful in terms of giving us advice on good restaurants and sights in Barca. Was a pleasure to stay here. Was in barcelona for primavera festival and everything was perfect. Huge patio area outside with full table/chairs and hammock! Rooms were big and beds comfy. The owner Gustavo was also very friendly, and was surprisingly available despite us being a few hours early. ...Location is a little out of the centre, its a cheap taxi or it was only two blocks from sagrada familia and its tube station so there are no complaints. Will be looking into returning here same time next year. appartement à réserver sans hésiter, situation géographique idéale pour visiter Barcelone, parkings à proximité conseillés. résidence calme, bel appartement bien agencé, tout pour réussir un bon séjour. The apartment is very big and beautiful. The terrace is awesome. The subway was 500 meters away. However I think that the apartment was a bit dirty. 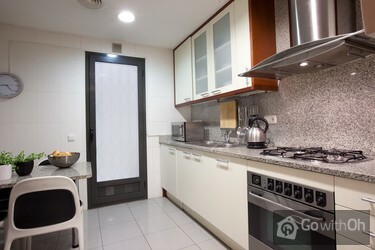 We found the apartment very comfortable ,only 5 mins from the Sagrada Familia and the metro connections,supermarkets round the corner .The apartment was well equipped and large outside drying area for the washing which was most useful. It certainly gave us space , flexibility and privacy which made our visit to Barcelona even more enjoyable . Het appartement is luxe: twee slaapkamers met goede bedden en 2 badkamers. Het grote terras is erg fijn. Er is zon, schaduw, ligbedden en een grote tafel met stoelen. De Sagra famillia is op loopafstand evenals de Metro. Het afhalen van het treinstation door de contactpersoon luxe en de door hem geleverde informatie over de stad was uitstekend. appartamento spazioso, comodo, pulito e silenzioso. completamente equipaggiato. non funzionano gli aspiratori nei bagni. buona posizione per la metro. Die Wohnung ist schön groß, sehr sauber und liegt wunderbar zentral für jegliche Ausflüge, da die Metro sehr gut erreichbar ist. Hervorzuheben ist die tolle Terrasse. Liegen, Auflagen, alles vorhanden.Einziges Makel, die Wohnung müsste einmal durchgesehen werden auf Mängel. Es funktionieren ...nicht alle Glühbirnen, die Toilettenspülung war in einem der Bäder defekt, so dass wir nur eine Toilette nutzen konnten, das Fenster in einem SZ konnte nicht richtig verschlossen werden, ebenso die Terrassentür. Leider sind die Matratzen sehr, sehr hart und daher unbequem. Aber es ist für uns alles kein Grund diese Wohnung nicht noch einmal zu buchen.Die Kontaktaufnahme mit mit der Kontaktperson lief super, G ist sehr freundlich, zuverlässig und sehr hilfsbereit. Ein dickes Dankeschön !!! Sehr geehrter Gast, vielen Dank für Ihr Feedback. Der Eigentümer bestätigt, dass er von Ihren Kommentaren Kenntnis genommen und die Wohnung überprüft hat, um seinen Gästen immer einen qualitativ hochwertigen Service bieten zu können. Die Ferienwohnung war wirklich super. Auch G, unsere Kontaktperson war sehr nett und hat uns viele Tips für unsere Ausflüge gegeben. Alles in allem ein wundervoller Urlaub in einer ganz tollen Stadt. Die Wohnung ist wunderschön und die Kontaktperson sehr hilfsbereit und freundlich. Allerdings liegt die Wohnung über einer Autowerkstatt und tagsüber ist es daher relativ laut. Die Ferienwohnung ist gut gelegen und relativ ordentlich. Die riesige Terrasse ist toll für lange Abende, allerdings etwas herunter gekommen (keine Blumen, Tisch und Stühle benötigen dringend einen neuen Anstrich). Einkaufsmöglichkeiten und Restaurants sind ausreichend und fußläufig zu ...erreichen. Während unseres Aufenthaltes ist am Bettrahmen etwas kaputt gegangen.Die Kontaktperson hat sich trotz mehrmaliger telefonischer und schriftlicher Kontaktversuche erst am zweiten Tag gemeldet. Zudem wurden uns für die Reparatur (Anbringen von zwei Winkeln) 70 Euro in Rechnung gestellt. Es hat alles geklappt! Tolle Lage und Kontaktperson! 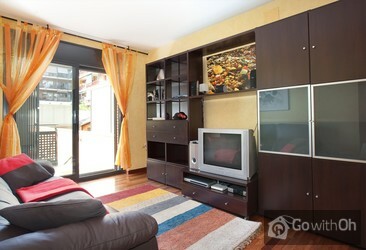 I totally recommend this apartment, it's in a great location for everything and just round the corner from Sagrada Familia. There is a shop near by and train station at Sagrada Familia.The apartment was lovely, and really clean.The owner was helpful and gave advice (and a map) on good places to go /... eat etc.Everything you need is here and you even get towels and the usual small samples you would get at a hotel.There's a DVD player, washing machine, Iron, and outside space to dry.We stayed for 8 days and it had everything you need to cook and feed yourself for this time.Can't think of anything bad to say - hope you enjoy your stay! Zeitpunkt zur Schlüsselübergabe war perfekt. Hilfreiche Tipps von G. waren sehr gut. Jederzeit wieder. El apartamento esta bien ubicado y equipado.Sin emabrgo, el tiempo de respuesta para las reparaciones es pobre. Se quemo un fusible y lo cambiaron 12 horas despues de reportado. Pasamos una noche sin aire acondicionado en verano de 40 grados. En otro aspecto, les hace falta mas personal, el dia del ...arrivo, la llave se entrego a las 7 pm cuando el Check in segun la pagina es 4 pm porque la persona estaba muy ocupada aclodando otros inquilinos. Mas personal para atender emergencias y reclamos. Estimado cliente, agradecemos y valoramos sus comentarios. El propietario confirma que el check-in se realizó a las 19h para que pudiera hacerlo una persona que hablara francés, según petición del cliente. Asimismo, el propietario confirma que cambiaron el fusible en la mayor brevedad posible. Great apartment , very spacious . Fantastic terrace . 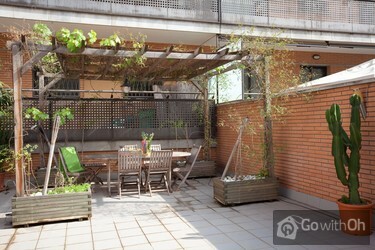 Nice quiet location close to supermarket and metro stop. Chambres séparées de la cuisine. Belle grande terrasse. Corde à linge. Bonne situation dans la ville. Voisins un peu bruyants. Disponibilité de G. Cuisine pourrait être plus equippée. Poêlons trop usés. Toutes les chaises (cuisine et salle à manger) n'ont pas plein dossier donc inconfortables. Belle propreté. Cher Client, léquipe dOh vous remercie pour vos commentaires, nous les avons bien pris en compte. Le propriétaire confirme avoir contrôlé les ustensiles de la cuisine, qui est parfaitement équipée pour la capacité de lappartement. Nous vous confirmons de nouvelles poêles ont été achetées en Novembre 2015. Wir hatten einen sehr schönen Aufenthalt in der Ferienwohnung und empfehlen diese gerne weiter. The facilities were in good condition Having two separate bathrooms was fantastic.The location was ideal.Taxi bay & bus area just outside the door . The apartment owner G was extremely helpful,giving us advice of places to visit and supplying maps as guides.He was a very pleasant and courteous man ...who couldn't do enough to help us enjoy our stay.Certainly recommend this apartment The owner was brilliant at making us feel so welcome.The location suited us perfectly. It's an excellent location - just a short walk from the Sagrada Familia (and metro) and a pleasant stroll to the Verdaguer metro. There's also a big supermarket just around the corner from this apartment. The outdoor terrace is huge with 4 sunbeds and a good-sized table for dining. The kitchen is ...well-equipped (and everything works!). The living room is a little small but with that big terrace, it's not really a problem. G. the owner's representative, was friendly and helpful. He replied instantly to our messages on arrival and has lots of info on the best restaurants. Quibbles? The terrace would be even nicer with a splash of colour . If I was the owner, I'd invest in a few geraniums. Nous avons passé un très bon séjour à Barcelone. Nous n'avons pas réussi à allumer le four,les ustensiles de cuisine gagneraient à être changés, mais ceux-ci n'ont été que de petits désagréments. L'appartement était très bien situé, propre, fonctionnel et aussi que chaque chambre ait sa salle de bain était très apprécié. Aussi il est rare qu'en location on retrouve des appartements dont les chambres sont équivalentes. Notre personne contact nous a réservé un accueil chaleureux et ...nous a donné plein d'informations très utiles. Merci G.! The freezer of the refrigeration was not working the whole time I was there. Would have been nice to have a place to store ice cream on those hot days. Bring your own toiletry and extra bathroom tissue. G was extremely helpful in all aspects of our stay. Could not fault. G, or host, was very organised and efficient. Friendly and helpful. Echt een top keuze! Het appartement ligt vlak bij Sagrada Familia, en de Rambla is goed te bereiken met de bus (wel nog stukje lopen, maar ja de stad is groot). De faciliteiten zijn zeer goed: alles is aanwezig, de airco doet het prima en de binnentuin is prive en heerlijk! De ontvangst was ook erg ...goed: goede communicatie vooraf en perfecte uitleg van alles (faciliteiten & extra info over de stad). Appartement bien et très calme. Il est aussi très bien placé. 4 petits bémols: le volet de l'une des chambres ne fonctionne pas, la porte d'entrée est difficile à ouvrir, le robinet de la cuisine aurait besoin d'être revissé et il manque de la vaisselle. A part cela, c'était très bien. Cher Client, nous vous remercions pour vos commentaires, nous les avons bien pris en compte. Le propriétaire confirme avoir vérifié la vaisselle pour quelle soit suffisante pour la capacité maximale de lappartement. Die Ferienwohnung war genau so, wie sie beschrieben ist mit einer schönen Terrasse. Öffentliche Verkehrsmittel sind gut erreichbar. Terrific location. Great apartment with two bedrooms and two baths. Maintenance is suffering a bit and the kitchen ware is sorely lacking. Cleaning is so-so (especially the wood floors). Bring toilet paper... only a partial role in each bath. No extra roles! G was helpful when the door lock would not turn (again maintenance!). Dear customer, we truly appreciate your comments. The owner confirms having checked the condition of the apartment and the kitchen utensils (as well as the quantity of the latter) in order to guarantee a high quality service for the clients.